Whilst it's not quite flip-flop weather yet, Spring and Summer shoes are certainly still emerging in street fashion and I'm really excited to update my collection with some new ones for the coming seasons. When I'm not at the stables and since I'm nowhere near the beach right now, my go to shoes tend to be boots, Vans (although not recently for obvious reasons), and Converse high tops and pumps. For the warmer seasons I still stick with those types of shoes but partner them with clothes more appropriate for the weather. However, when it comes to boots, for the warmer seasons, I like ones that show a little more skin yet are just as edgy. The latest edition to my collection is this gorgeous pair of Kylee Lace Up Tassel Ankle Boots* from Online Avenue in Mocha Suede. The suede (faux) is super soft and works well with a chunk heal. They boots also come in black, but since spring and summer call for brighter clothes, I'm looking to transition my wardrobe to lighter colours and styles. The Mocha Suede is such a chic colour, and goes really with a lot of others. When it comes to heels, I much prefer block heels because they're far easier to walk on, so much more practical for day looks, yet always chic enough to style in the evening. These Kylee Lace Up's are so versatile; they work perfectly with jeans and leggings, however when styled with a knee length or maxi dress, they look just as gorgeous. The tassel detail adds a bit of personality to the boots, and I certainly don't own anything with tassels on them, so this style is new and refreshing for me. What are your Spring/Summer Shoe collection additions? 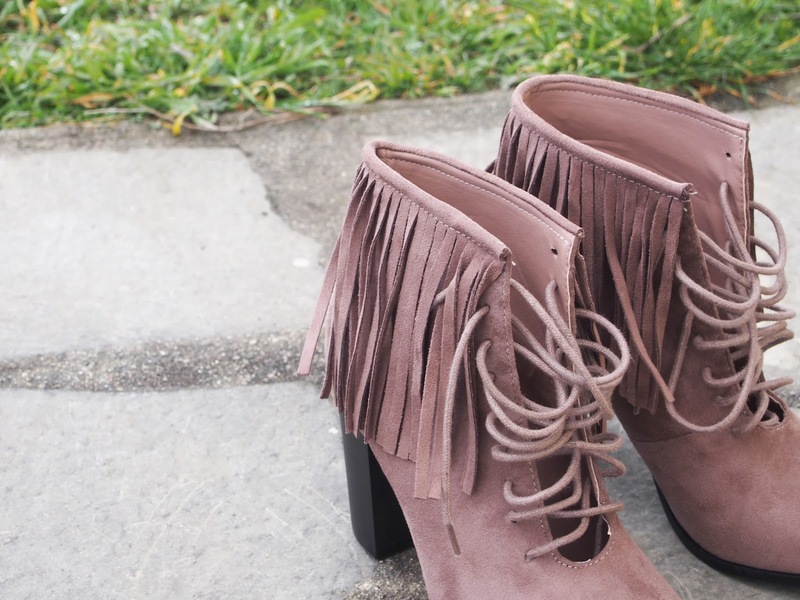 What do you think of my new boots from Online Avenue?